Adjustable hair clippers have their kings Andis Master and Wahl Senior. 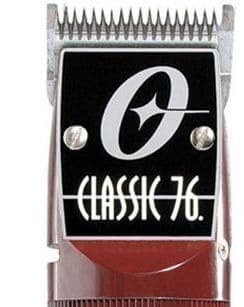 Detachable clippers for barbers have one emperor – and that is the Oster Classic 76. You can say a lot of praises about this beast of a barber tool. Undoubtedly, one of its most cherished features are the Oster 76 blades. When you buy this model, your Oster blades set will include a #000 and #1 detachable Oster clipper blade. These are the most commonly used blade sizes, so there’s nothing surprising. If you’ve ever had an adjustable clipper (like Andis Master or Wahl cordless Magic clip), you know these have an “open” and “closed” position. As you can see, the blades from #00000 to #000 are for quite close cuts. The #00000 is for a complete shave, resulting in a totally bald look. The #0000 and #000 are amazing for bald fades. A #0A is perfect for light caesar haircuts. While the #1A Oster Classic 76 blade is fitting if you want to use it as a clipper for fades, the #1 is for bulk hair removal. I want to emphasize on #3 1/2 and #3 3/4. They are awesome for getting some length on the nape and the sides and taking it from there afterwards. With the special 18 Skiptooth, Texturing and Flattop T included, you have fourteen blades to pick from. Quite the variety! By the way, if you still haven’t decided whether you want this hair cutter, head out to our professional Classic 76 clipper review. It will help you gauge whether it fits your style. What makes Oster Classic 76 blades so special? The masterful art of producing and strengthening any Oster 76 blades set is outstanding. I doubt there’s something as meticulous as their creation. Maybe only Andis equally spectacular CeramicEdge blades used by their barber BGRc clipper. First, the blades are treated in scorching heat of around 1000°F. This lasts for an hour or so. The purpose is to allow the <=1.2% carbon to disperse equally among the steel material. Every speck of the blade gets “infused” with the carbon molecules’ strength. Then, the Oster Classic 76 blades are thrown into the exact opposite: a harsh, freezing environment. In temperatures lower than 300°F, these beauties spend over 20 hours to receive a further boost in their durability. The result is an insanely solid, long-lasting and ultra tough blade that cuts through any hair type with zero effort. A knife blade of tremendous quality will rank around 55 to 60 on the Rockwell scale. Oster 76 blades can take pride in a 62 to 66 score. That doesn’t mean you should neglect your Oster clipper blades. The opposite: owning such a beauty should inspire you to undertake proper clipper blade maintenance. Make sure you oil your Oster 76 blades frequently so it cuts smoothly and lasts even longer. In case your blades run hot (and they do, considering this Oster barber cutter’s power), spray some coolant on them. At first, you’ll think you’ll never be able to cope with Oster 76 blades. Changing them seems so intimidating, you’d think! Think about it. Didn’t cutting your own hair with clippers seem like a scary thing to do in the beginning too? To be honest, changing Oster 76 clipper blades will be ridiculously easy for you once you ditch the fear. Here’s how I do it – in line with what Oster themselves recommend. Pick the Oster 76 blade at its sides. Pull away from the clipper head gently, but with a quick motion. This will release the latch that’s holding it. Then, remove it by sliding it off. WARNING: this lever stops on different places when you turn off the Oster barber clipper. This leads to the risk of the new blade not properly lining up and falling in too hard. Why does it matter? In time, the blade will get loose and will start pulling hair. And nobody likes a powerful beast of a hair cutter pulling on their locks. Letting the hair clipper run while inserting the new Oster Classic 76 blade will avoid such a hassle. Again, don’t worry about it – you won’t get hurt if you follow these directions. The new Oster blade will snap back on very easily. Hi! I recently purchased the oster 76 and some attachment combs (while i save to buy the blades one at a time) you say that using the #000 is like using a closed blade- I have a few questions. If I use the #000 blade with a #3 attachment comb that would be equal to a closed #3 on any other clipper? And assuming that is correct, my second question is, what blade would I use with a #3 comb to get the effect that an OPEN #3 guard would have with any other clipper? This is what I’m trying to find out as well! I would say either the 1 or the 1A would give you the effect you’re looking for. Will a blade for model 50 fit the 76? Wow, we really didn’t see your comment, sorry about that! Honestly, I’m not familiar with the Model 50. Are you from the US? Clipper model names sometimes differ across countries, so it might be something localized. If it’s a detachable blade clipper, Oster tend to share their blades across all their models without an issue! You mean a #3 1/2 size blade? It leaves hair at 3/8″ so you could go with it. A #3 size guard will achieve the same result – you just have to be careful on which Oster 76 blade you’re putting it. Do you have a #000 blade or a #1? Thanks for the info! Which blade is used for the guides? I find 000 works well with the plastic guides. Why is there not a #3? Only a 3 1/2. They do have a #3, but it’s a Cryogen X blade for pets. Oster’s blades for human hair clippers have only the 3 1/2 followed by 3 3/4. I’ve wondered too, but maybe blending with the 3 1/2 achieves similar results so it wouldn’t make sense for them to have a #3 too? Above all, however, the length of the #3 1/2 blade is the same as the length of a #3 clipper guard. So it’s just the number label that differs. Wondering if you can answer a question of blades vs. guides. I use the Oster fast feed with the stock 913-50 blade, and the blending comb/guide (which I understand is about 1/8″) to shave my head down to a shortish stubble. BUT, the plastic comb keeps breaking, and I have to order replacements now and then. I’m trying to figure out if there’s an alternate metal blade that I could use without a plastic comb, and still get my desired length (I still have some old Wahl #1: 3mm – 1/8″ combs, but those don’t fit) . Possibly using the side thumb lever to retract or extend the blade in combination with some particular length of blade would yield the same length? Thanks for any help! Summed up in short, what a lot of barbers and home users do, is grab a pair of Andis magnetic guards. They’re more durable and allow for a better “fit” to the blade. A bit expensive, but probably the best choice. As you said, Wahl guards come in different dimensions, so no Oster or Andis clipper can use them. Otherwise what some people do is perform a zero gap on their Fast Feeds with an Andis ceramic blade. This is more advanced, however, and I’d recommend it only if you feel like experimenting. Zero gapping also increases the chances of you poking your head, so that’s another drawback. I will look into the Andis purple magnetic guides next time my plastic Oster one breaks. Meanwhile, I am still wondering if you know the answer to my original question. Is there a stand-alone replacement Oster blade that can accomplish the same length as the 1/8″ guide on the Fast Feed (used in its shortest position)? Maybe the #1A based on your chart, if the 76 blades would fit my model? I think my old Wahl #1 guide was also 1/8″, so that’s more or less my target length. It seems like a blade-only approach would be the most durable, and I’m not clear if Oster makes any alternatives for the Fast Feed, or just other models. If only the model 76 accepts all the various blades, that would be good to know for the future. Anyhow, thanks again for your help. Ryan’s away for Thanksgiving, so I figured I’d reply to you! The problem is that the #1A on this chart is, as you guessed, only for Oster’s detachable clippers. It won’t fit the Fast Feed. They do have this “Medium blade” here: http://www.osterstyle.com/blades/clipper-blades/oster-medium-blade-for-adjustable-clippers/076913-506-001.html which is for their adjustable line. However…from what I see, it, as well as all the adjustable blades Oster have are 000-1 (so the usual Fast Feed length.) What differs is the amount of teeth on the blades. Maybe if you wrote to their support they’d be able to help? Hope I helped at least a little bit! I have a question about oster outline trimmers, tee trimmers. I have had mine only 5 months, work at Supercuts so they are being used rapidly but all of the sudden they no longer cut the hair but push it around. What is the problem? Hi Stephanie! Sorry for the late reply. In other words, it seems like the blade is misaligned? Does it also nick the skin? 2) The motor is at fault and doesn’t transfer enough power to the blades. Can u be more specific please? A 1a for fades? Like what kind of fade and when and how am I using it? I asked Zoot and couldn’t get a straight answer. 1a as a guideline? Clipper over comb? Same with the 1 guard, it removes bulk how? Clipper over comb? I keep hearing the same thing about these blades but no one wants to go in detail. When I fade I do both methods . blade by blade and skip blade . Yet I find between the 1 and 1A there always seem to be a light line . How can I erase that line ? Hi Rudy, great question. You always want to make sure that you blend properly whenever you do a fade. Once you’ve done the 1 and the 1A, you’ll want to fade down using the 1 1/2. You really have to concentrate on the blending because this section is going to be the most obvious. Alternatively, you could put it on 1 in a closed position with a guard. Keeping the blades closed, or at least in the middle, is important for fading. You might even consider getting a ceramic blade for the bottom to help them to cut even closer. Hello, the advice to turn off the hair clipper while changing the blades is also applicable for the Supra ZR ??? clipper to lock into position. I have a question about changing the blades. In the instruction manual of m 76 Oster clipper it says to change the blade when it is turned off. The video I watched says to change the blade while it is running. The official manual will have you turn the blade off just to take extra precautions. They don’t want to be blamed in the case that someone’s not careful and cuts their fingers. However, as the video shows, if you don’t keep the blade on while you change them, you’ll end up damaging the lever that vibrates on the inside. You’ll wear down the inside moving parts on the inside very quickly if you don’t remove the blade, so it’s better to follow the advice in the video. Because it’s an official Oster video, you can trust the advice as credible and useful. What is the difference between texturizing and skiptooth blade? I assume when you ask about an open #3 blade on other clippers that you mean the metal blades that work on the Andis rotary system clippers as well as any of the Osters like the 76 or Model 10. If that is the case then, unfortunately, you can’t get exactly the same length. That said, it is close enough that you would be very hard pressed to tell the difference. With a 3 3/4 metal blade you will get as close to the same as possible as the open #3 guard with a #000. I hope that helps.